The great Italian Renaissance painter, sculptor, and architect Michelangelo (1475–1564) created the most influential fresco paintings in the history of Western art, including the Sistine Chapel's scenes from Genesis and The Last Judgement. His masterpieces of painting and sculpture are some of the most significant works of all time and it is through Michelangelo's genius that the concepts of modern art were founded. 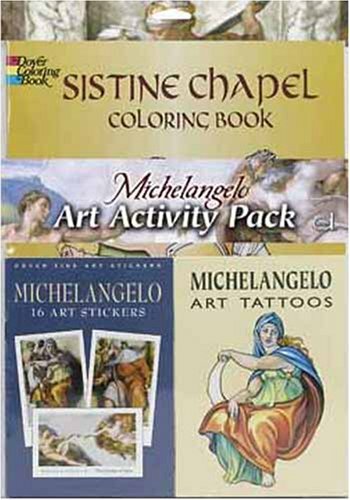 Thirty ready-to-color adaptations of Michelangelo's glorious designs from the Sistine Chapel's scenes offer you the unique opportunity to duplicate the originals or to create your own vibrant versions. Sixteen sticker masterworks: The Creation of Adam, The Prophet Ezekiel, Temptation and Expulsion, and more. It's easy to turn something drab into a fantastic fresco! Four colorful body art images are safe to apply and simple to remove. If you have any questions about this product by Dover Publications, contact us by completing and submitting the form below. If you are looking for a specif part number, please include it with your message.